I learned a pretty awesome skill from my math teacher in high school. 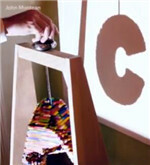 He taught us how to create an artwork based on mathematical principles. Our math teacher is really one of a kind, I mean, normally you might be bored out of your mind in math classes, but in his class, he could always find a way to spice things up and make everything about math intriguing. 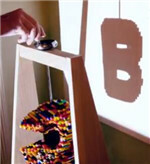 It’s like making hand shadow puppets, but instead of using hands, we used small cubes. We carved three different shapes into the three faces that are next to each other, you know, the three faces that share one corner, and when you rotate this cube, you would see the shadows of the three different shapes in turn on the wall. I still remember how thrilled we were when our teacher showed us how it worked. 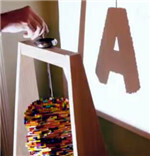 At fist, the small sculpture looks so abstract, I mean, we didn’t know what it was, but when the light was on, we saw a shadow in the shape of the letter ‘A’ on the wall, and then our teacher rotated the sculpture to a certain angle, and magically, the letter ‘D’ showed up on the wall. We were like ‘wow’, but there’s more, when our teacher rotated the sculpture again, we saw the letter C. That was quite a jaw-dropping performance for a bunch of high school students, you know. The principle behind it is actually quite simple, but it’s a little bit hard to example without a 3-D model, so I’ll just skip that part. Anyway, after that class, all of us learned how to do this magic trick. I never thought math class could be so entertaining. I just bought this awesome new CD! The principle behind it is very simple. There are three fundamental principles of teamwork. Discussing all these details will get us nowhere; we must get back to first principles (= the most basic rules). My father was one of a kind—I'll never be like him. He exaggerated the details to spice up the story. Her conversation is always spiced with humor. These discoveries raise intriguing questions.